One of the most rewarding things about my job is having the opportunity to revisit areas that I have designed. Despite designing landscapes for over 17 years, I never tire of having the opportunity to explore them again to see how the landscape has matured. When touring the landscapes, I take time to look at what worked and sometimes what didn’t. I take these lessons with me and implement them in future designs. 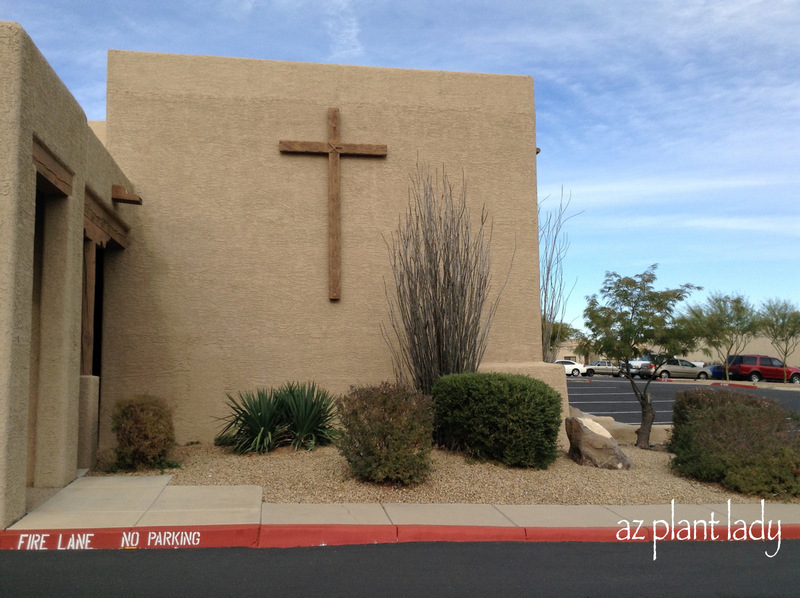 Today, I’d like to take you on a tour of a landscape that I designed for a church two years ago. I was asked by the landscape committee to create a landscape that would be filled with color during the cool season since that is when the majority of the members are attending. The landscape was filled with over-pruned shrubs, many of which flowered in summer. In addition, there were a large number of frost tender plants in the landscape that were unsightly when much of the residents were in town. After removing the shrubs, I added feathery cassia (Senna artemisoides), which blooms in late winter and spring, along with the newer Blue Bells (Eremophila hygrophana) which flowers all year long while staying at a rather compact 3 feet tall and wide size. When working with an existing landscape, I always try to keep mature plants that are healthy and fulfill the design criteria. In this case, a Mexican (Yellow) Bird-of-Paradise (Caesalpinia mexicana), that had been trained into a tree, which has evergreen foliage and flowers in spring and fall. Blue Bell shrubs and golden barrel cacti (Echinocactus grusonii) completed this planting area. 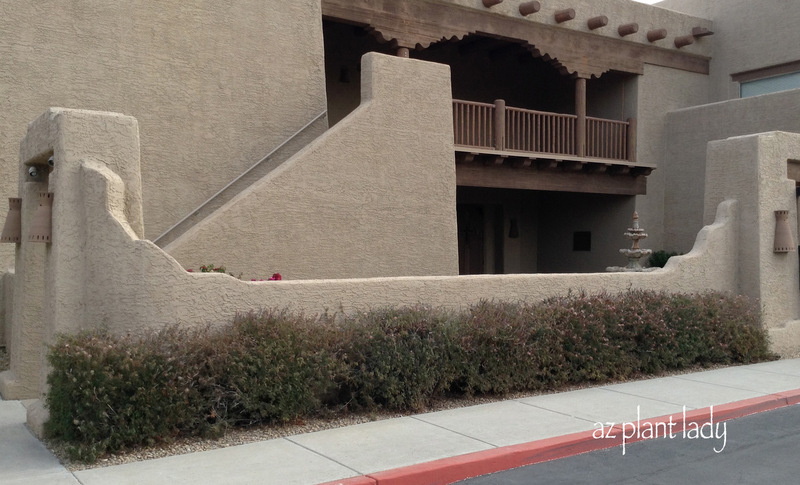 In this area, a few shrubs, a barrel cactus and a lonely red yucca hang on from the previously designed landscape, all of which add little interest to the landscape. Contrasting textures and color add interest to the landscape throughout the entire year. Seasonal blooming creates an entirely different look to the landscape as well. As landscapes age, plants can become overgrown and to some, unattractive as was the case with this old desert spoon. 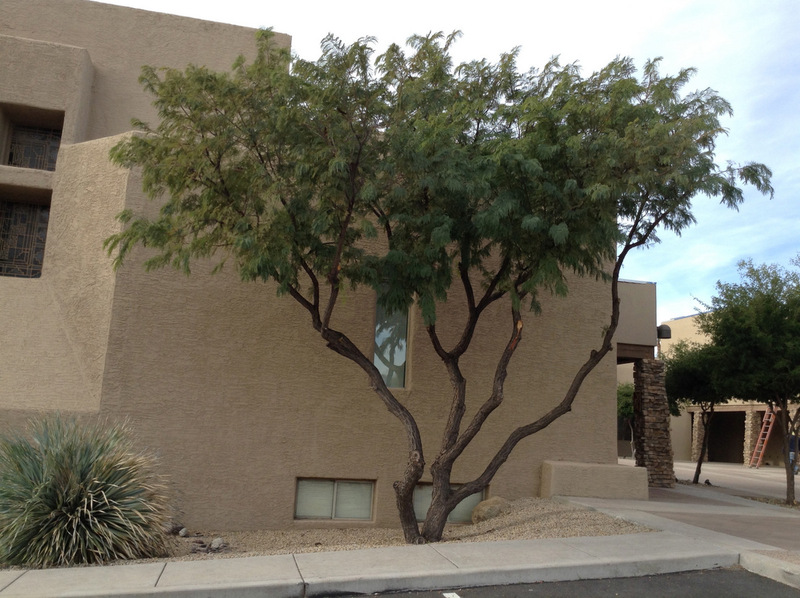 The lysiloma tree was in good shape and the decision was made to keep it. Angelita daisy (Tetraneuris acaulis) is one of my favorite small perennials as its bright, sunny flowers appear throughout the entire year. Valentine bush and feathery cassia serve as foundation planting. Pink fairy duster (Calliandra eriophylla) had been used to create a hedge. However, while pink fairy duster does flower in winter and spring, it isn’t a suitable choice as a formal hedge. Rather, it belongs in a natural desert landscape and untouched by hedge trimmers. Pink Muhly (Muhlenbergia capillaris) in winter. Pink muhly was added for welcome fall color when its plumes turn a vibrant burgundy color, which fade to an attractive wheat color in winter. After being pruned in early spring, bright green growth quickly fills back in. This is a high-profile corner as it is one of the entries into the church parking lot. As you can see, there was little to attract the attention of passersby. Adding a combination of plants that will ensure year round interest no matter whether it’s spring, summer, fall or winter. Even though the purple trailing lantana (Lantana montevidensis) can die back to the ground in winter, the bright colors of the Valentine bush and feathery cassia will draw attention away from it. Three Agave americana were all that sat in this area, which offered little color and virtually no interest. I took the existing agave and spread them throughout the landscape, where they can create both texture and color contrast when paired with the softer shapes and darker colors of shrubs. One thing that I wish I had done differently was to space the shrubs in this area a little further apart. This can cause landscapers to excessively prune shrubs into poodle shapes in an attempt to keep them from touching. Pruning them severely once a year can keep them from outgrowing their space OR removing every other shrub once they become too large can take care of the problem. I hope that you enjoyed seeing the transformation of this landscape to one filled with cool season color. Looks great – terrific job! I love the idea of your post – to go back and see how a landscape has evolved since you planted it a couple of years ago. I noticed you are a big fan of leaving empty space between plants. In general, I think that's a great idea, but I know here in the Southeast, leaving open space is an invitation for weeds to pop up. Is that less of a problem in a desert landscape like Arizona? Or do you still have to do a lot of maintenance weeding? Great question, as always. 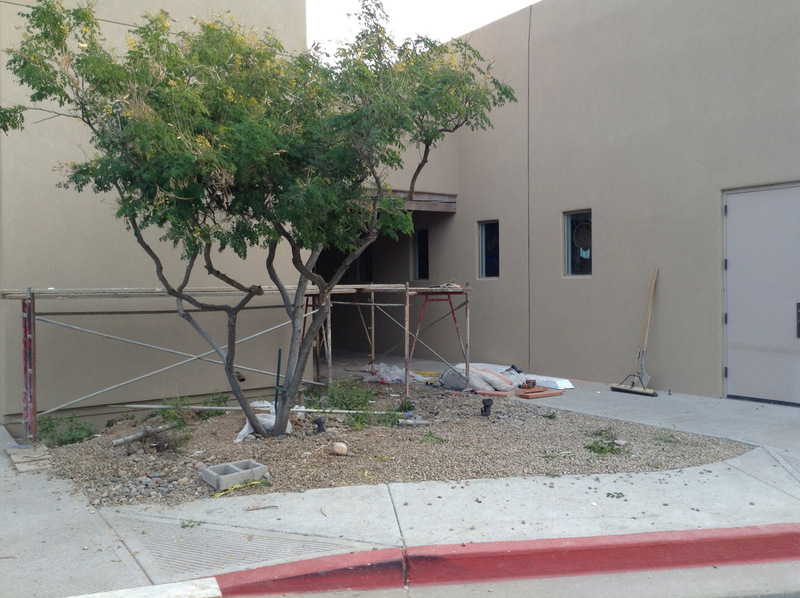 Landscape design in the desert Southwest does tend to have empty spaces in-between plants. Rock mulch keeps weeds down and the scarcity of water tends to limit the amount of plants in the landscape. In addition the unique shapes of plants in general can be better appreciated with some empty spaces in between as well. The other problem is that there is an epidemic of excessive pruning, that rids plants of their natural shape and flowers. By allowing room between plants this is less likely to happen. While this type of landscaping is completely foreign to me, I still thoroughly enjoyed seeing the updates! You've done a wonderful job, for sure. Thank you so much for your kind words, Jean.